Order your Cross Century II Medalist Fountain Pen today from FahrneysPens.com. Fine Pens, Refills & Luxurious Gifts – great prices & fast shipping. The Cross Century II Medalist Fountain Pen is the modern version of the original Cross profile with a popular medium-diameter barrel, conical top and single cap ring. The contemporary Medalist finish is a striking two-tone metal combination of polished chrome and 23K gold plate. 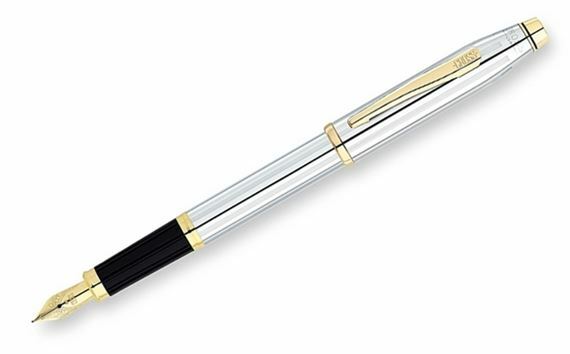 The Medalist fountain pen has a 22K gold-plated nib and uses cartridges or converter. Converter not included. Created with a keen appreciation for modernist design and lasting value, Century II offers a bolder look and wider girth than the original Classic Century. Saturated with color or finessed with fine metal, it's everything Cross is famous for, only 'bigger'.